Sally, the soccer mom, sees Molly, another soccer mom, by being at most of the practice sessions and soccer games in which their two little girls participate. The little girls become instant friends. Sally and Molly take a little longer. Sally works at a relationship of integrity. The ladies become “soccer mom friends.” Time passes. They talk about many things. They share about their likes, their dislikes. They Facebook. They meet for coffee. Trust levels increase. They become friends, not just “soccer mom friends.” One day Molly seems a bit agitated. Sally, doesn’t pry, but as always she is friendly and encouraging. They sit with one another observing the game. They cheer. They chat about the usual small talk. Molly then says something out of the ordinary. She complains, not terribly, just simply about something her husband did. Sally just listens. She makes no observations. She just listens. She lets Molly be Molly. Maybe the only words she utters are something like, “Molly, I’m sorry things are not going as well as you like.” Something simple like that. Time passes. Days pass. Friendship grows. Molly talks. Sally is a good friend. One day, who knows why this day, maybe it just feels right, Molly once again is discouraged and shares something personal. In response, Sally says, “That must be frustrating. I don’t know what I would do without prayer when I deal with tough times.” She then goes right back to listening. That’s a God bomb. Over time, Sally refers to her life with the Savior as simply and as meaningfully as she refers to her family, her hopes, her dreams, her daughter’s last game, her work, and what she has cooking in the oven. She and Molly become good friends. She doesn’t drop the entire Book of Romans on Molly as they discuss their lives with one another. However, over time, it becomes rather obvious to Molly how important the Lord is to Sally–and it doesn’t repel, it compels. One day it all falls into place. Sally has prayed and prayed for her friend. Molly’s heart is open to a simple invitation. It might look a little like this brief video…except, of course, it will be far more in keeping with the special nature of the friendship shared between Sally and Molly. It may be an invitation to a concert, to church, a retreat, or, better still, it may be an invitation to the Savior. But it won’t be awkward. It won’t be stiff. It will be a simple invitation…one as simple and natural as an invitation to meet for lunch. As you contemplate heaven and hell, consider the empty chair. I’m not sure, but I think my son, Daniel, once had shades of Snoopy lingering in his thoughts. 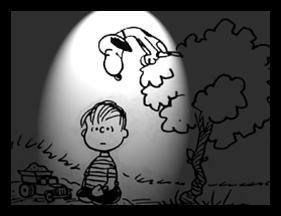 You know, that particular image of Snoopy perched in a tree like a vulture keeping watch over everything below. Ready to pounce. Ready to provide. Ready to protect. It’s okay. I got this. It happened during that period of time when a mom and dad begin to nudge the responsibility and self-discipline training to the next level. Daniel was about 10 years old. Vanita and I had discussed some timing issues and some method issues regarding Daniel’s training. One of the items we chose was to leave him at home alone for a half hour or so. Now all ya’ll know where this was designed to go. And it did. “Really? I can stay here,” he asked. Driving away produced no small amount of stress, but drive away we did. Training goes like that. A little older…a little more instruction…a little more responsibility…a little more autonomy to achieve success…a little more grace for the slips…and a whole lot of praying. We drove away with the stress and moderated it with the praying. All these years later, I’m happy to report success. Back then, well, let’s just say I wasn’t always so sure. We were anxious to get home, but we gave Daniel the time we had predetermined. We pulled into the drive way…and the excitement began. Daniel came on the run…not from the front door, not from the back door, but from up in a tree. The tree was one of his favorite toys. It was one of those classic climbing trees. Situated just off the front porch and overlooking the front door, it provided a low branch for a swing and a tall climb for rambunctious kids. Apparently, it also provided Daniel with a fantastic ninja position. A little bewildered, we just kind of stood there looking perplexed. “Daniel, wait, wait. What are you talking about,” I asked. “The hatchet? Daniel, what? Why the hatchet? You know it only has certain uses and I need to be around when you use it,” I said with a nod to authority. On the inside, though, I knew where this was going and my Father/Daddy/Papa/Dear ‘ol Dad pride meter was climbing at break-neck speed. “And the lady,” we asked. Just like that, it was okay. It was okay. Mom gave him a big, long hug. I gave him a high five. It was okay. Still is. Update: Daniel and Abby, happily married, love one another and our Lord more and more everyday, help others and their little Rachel to do the same thing, and expect a brand new little baby boy any day now! Where is he? Where am I? Saw this spoken word by way of a random search. Awesome. Think I’ll get a coach and learn how to do this. I really like what young people are doing with different forms of communicating the hope found only in God the Father, Son, and Holy Spirit. I read about an exasperated mom who sent her disobedient little boy to his room. When his time was up, he came out far more confident than when he had gone in. We can laugh because we totally get it. It seems logical that we would. However, like the children in the above anecdotes and unlike the advice in the quotes from Mr. Law and Mr. Lincoln, most people, if they think to pray at all during times of conflict, pray for themselves. They pray for victory. They pray for personal advantage. The Bible, however, leads us another direction. So how should we pray when faced with conflict? Well, in a follow-up message to this message, we’ll get some real nitty-gritty, moment by moment advice as we investigate the conflict resolution model the Apostle Paul gave the two church ladies, Euodia and Syntyche, in Philippians 4:2-7. However, before that, let’s first consider why we should pray for conflict resolution. The “why” question is almost always the most important question. If we do not know why we should do something, we will more than likely fail to have much, if any, motivation for doing it. So, let’s get to it. Did you pay attention? Look at the last two sentences again: “I have given them your word and the world has hated them, for they are not of the world any more than I am of the world. My prayer is not that you take them out of the world but that you protect them from the evil one.” Praying on behalf of the apostles, Jesus said the world would hate them. Yet, he did not ask that they be removed from that hatred. He did not ask God to knock-out those who would generate and extend that hatred. Instead, he simply prayed they be protected from the evil one. In the face of hatred and conflict, Jesus simply wanted the apostles to avoid giving in to Satan. second, unbelievers would believe that God the Father loves us as much as he loves his One and Only Son. Now if this is true, the opposite is also true. If we allow conflict to divide us, if we allow disunity to be the hallmark of who we are, the world will not believe God the Father sent God the Son and the world will not believe that God loves us. They will be wrong, but they will have arrived at a reasonable conclusion. It will be reasonable to them, because we—through our lack of agenda harmony—will have given them every reason to believe just the opposite of the truth. If and when we allow conflict to tear us apart, we also destroy our effectiveness as ambassadors for Christ. Question: What does all this teach us about prayer and conflict resolution? Well, at the very least, it teaches us that whenever we face conflict our motivation to pray should stem from a hope that in all we say and do we will not destroy our testimony. and, as Jesus did, we should pray that unity will be of greater value to everyone involved than our personal differences. Think about it. You are faced with conflict. You now have a choice. You can react without thinking. If you do, you will not pray. You will engage your opponent in your own strength. When you do, you will be susceptible to the evil one and your conflict may very well blow up in your face. Your testimony will be damaged. If there are unbelievers involved or observing you will jeopardize their opportunity for seeing the truth about God. You can wait to respond. If you do, you may think to pray. When you pray you can ask God to protect you from the influence of the evil one. You can ask God to help you value your relationship more than the issue causing conflict. And you can ask God to help you negotiate this conflict in a way that maintains your testimony. Think about it. How would this change the patterns between a husband and wife? How would this alter the many disputes found within church congregations? How would this impact the negotiations between co-workers? How would this counter the tension between management and labor? That’s motivation.